Fans of Buffy the Vampire Slayer will dig this sassy, smart heroine who faces all the creatures that go bump in the night. Me? Well, that’s the scary part. The Real World is a frightening place. Just ask sixteen-year-old orphan Dru Anderson, a tough girl who has taken down her fair share of bad guys. She’s armed, dangerous, and ready to kill first and ask questions later. So it’s gonna take her a while to figure out who she can trust . . .
Dru Anderson has been ‘strange’ for as long as she can remember, traveling from town to town with her father to hunt the things that go bump in the night. It’s a weird life, but a good one – until it all explodes in an icy, broken-down Dakota town when a hungry zombie busts through her kitchen door. Alone, terrified, and trapped, Dru’s going to need every inch of her wit and training to stay alive. The monsters have decided to hunt back – and this time, Dru’s on their menu. Chances of survival? Slim to none. If she can’t last until sunup, it’s game over . . .
Dru and her creature-hunting dad are staying in a small town, trying to live a somewhat normal life despite their knowledge of the Real World. When her dad goes to investigate a lead and returns a zombie, Dru is left with no choice but to defend herself as her world flips upside down. Now, she’s being hunted by some supernatural baddies, and her only allies are the enigmatic Christophe and the chatty, awkward Graves, who’s recently been turned into a half-werewolf. If she can escape the city before an old enemy gets to her, she’ll have to find out who’s really targeting her and if she can survive the encounter. I really enjoy the characters in this one. Dru is tough and very reminiscent of Buffy Summers for me. She’s very protective, sarcastic, and not afraid to stand up for herself. Sometimes she does things that scare her and poor Graves, her new best friend, who gets bitten by a wulfen. The story mostly focuses on the two of them and their situation, and it’s a nice setup for a best-friend-forever or possibly more. I only rated this a four because there were certain scenes I struggled with, mostly action scenes that threw me off. I didn’t really get the water fountain scene in the mall or how Dru managed to kill off the hellhound. And the chase scene in the van also confused me with its sporadic, unclear details. Besides those two parts, everything else was kosher. It’s filled with sincere, tender moments that clash wonderfully with the intense action and supernatural tension.I really enjoyed it and I imagine many others would too. Vampire Academy series by Richelle Mead; Morganville Vampires series by Rachel Caine; Madison Avery trilogy by Kim Harrison. Publisher’s Description: When I moved to New York to become a world famous journalist, I never imagined that snagging a job at a seedy tabloid would change my career path from trashy reporter to undercover agent. I’m Makenna Fraser, a Seer for SPI. I can see through any disguise, shield, or spell that a paranormal pest can come up with. I track down creatures and my partner, Ian Byrne, takes them out—usually saving my skin in the process. Our cases are generally pretty routine, but a sickle-wielding serial killer has been prowling the city’s subway tunnels. And the murderer’s not human. The fiend in question, a descendant of Grendel—yes, that Grendel—shares his ancestor’s hatred of parties, revelry, and drunkards. And with New Year’s Eve in Times Square only two days away, we need to bag him quickly. Because if we don’t find him—and the organization behind him—by midnight, our secret’s out and everyone’s time is up. Hey Nell! Guess who narrates the audiobook of The Grendel Affair. Oh, Wait! I know this… her voice is familiar! Where do I know her from? Johanna Parker narrates The Grendel Affair AND the Sookie Stackhouse novels by Charlaine Harris! I just finished listening to the book and it was pretty good. I received this book from Goodread’s First Reads program early last year. Now that the sequel is out, I wanted to read it again to remind myself what happened in the story. I liked the book in audio. You’ve read this book, haven’t you? Yes, I have. I have read it twice and listened to it audio once. It’s a great world with fun characters. I started the Dragon Conspiracy-I’m about 15% into the book as we speak. Oh, good. Me, too. I wanna see what nasty monster Makenna and Ian get to fight next. So, do you think there will be a romance between Makenna & Ian? I’m betting not… he seems too stuffy. What do you think? I’m looking for monsters and you’re looking for romance. Doesn’t that just describe us both? I can’t help it. Monsters will always be there, but romance is a fleeting thing. Main characters: ♥♥♥♥♥ At first, I thought Makenna Frasier was kind of wimpy. It didn’t take long – not very long at all- to discover that she was anything but wimpy. She was smart, able to think on her feet and she was a very believable character. She was not Wonder Woman like some protagonists portray themselves. She was just an ordinary woman hell-bent on making this new job work. Ian Frasier, Makenna’s new partner, was very patronizing at first. He was a seasoned veteran of monster hunting and knew that if he didn’t protect Mac, she’d never make it. He had lost a partner and he was not going to let it happen again. He beat himself up over that loss and immersed himself in responsibility, responsibility, responsibility. Mac didn’t want to be anyone’s responsibility. She figured out that she needed to protect herself so she wouldn’t be a liability to her team. She may have a special skill that is hard to find and worthy of protection, but she used her common sense and helped the other monster fighters as best as she could. Other characters: ♥♥♥♥♥ Kenji Hayashi was my favorite. Technogeek extraordinaire. Vivienne Sagadraco was next. Rolf Haagan was Rambo on steroids – but he kept his sense of humor. Roy Benoit – he I would like to actually meet. I’m a sucker for a southern accent. Whoo-wee. Actually, all the characters were really entertaining. I liked them all – except for the grendels. They were scary. World: ♥♥♥♥♥ The world is full of creatures that humans do not know exist. It’s SPI’s responsibility to keep those creatures under wraps. Makenna is a seer and she can ‘see’ the creatures for what they are instead of any glamour they might use. Story: ♥♥♥♥♥ The story was excellent. I loved every bit of it. It was so good that I read it twice and listened to the audio too. The mystery was well incorporated and it was fun seeing New York though Makenna. There is a literary reference to Beowulf incorporated in the story, along with dragons, elves, vampires, and other creatures. I thought there may be a romance with Mac and Ian, but it only briefly hinted. The author really did well with this story. It had humor and seriousness (as serious as monsters invading Times Square could be). Overall: ♥♥♥♥♥ I enjoyed this book very much. The pages flew by, and it was just as good the third time as it was the first. The characters were very likable and genuine. There is a good-spirited rapport between agents and their ‘trophies’ that they each had on their desks. Makenna was bound and determined she would have a weapon, and her putting Tequila in a squirt gun was just one of the many things she tried to succeed. In the end, she has proven herself as an asset and a darn good one. There was no cliffhanger, and I am looking forward to reading the next in the series. Main Characters: ♥♥♥♥♥ Makenna (Mac) Fraser is a likable character. She’s not perfect, she’s not superior, she’s just your average gal adjusting to a new job. She has funny quirks, only one special skill — the ability to see through glamours and veils — and is both afraid and brave. I love the fact that a smear of powdered sugar from eating too many cookies is what helps establish her credibility and that her contribution to the monster-fighting team is to shoot paintballs. The story is told first-person through Makenna, so the reader gets to know her very well throughout the book and is easily able to identify with her and invest in her success. Other Characters: ♥♥♥♥♥ Ian Byrne, Makenna’s partner/bodyguard, is a professional agent, in contrast to Makenna, and does what he can to keep her safe. At first, I thought Ian was going to be an overly-protective male for the whole book, but that wasn’t the case. Ian is protective, having lost a partner in the past, but he recognizes that he can protect Makenna only so much and that she needs to be able to protect herself. Luckily, Ian has a sense of humor and is able to accept Makenna for who she is, quirks and all. I think the two make a good pair. I really enjoy the rest of the supporting cast as well: Ollie, the self-centered merchant of all things spooky; Yasha, the Russian werewolf driver; Kenji, the Japanese half-elf techie; Vivienne Sagadraco, British dragon and founder of SPI; and Rolf Haagen, the crazy Scandinavian with the prosthetic arm. Ms. Shearin certainly has embraced diversity in her characters as far as nationality AND species. World: ♥♥♥♥♥ It seems all the monsters exist in Makenna’s world — dragons, elves, goblins, werewolves, vampires, ghouls, leprechauns, grendels, magicians, witches, dopplegangers, and more. One ancient dragon, Vivienne Sagadraco, has created SPI — Supernatural Protection and Investigations — to protect the humans and good supernaturals from the bad supernaturals and keep the magical world under wraps. SPI operates like a private FBI and police force, employing both humans and supernaturals toward the cause. Story: ♥♥♥♥♥ In this first adventure, a pair of grendels are loose in NYC, ready to rampage through Times Square on New Year’s Eve in order to bring the supernaturals out of the closet and into the power some creatures believe they deserve. Makenna, Ian, Yasha, Rolf, and the others are tasked to bring down the grendels without revealing them to the world. Mayhem ensues. For the most part, I like the story. The time the group spends hunting the grendels in the tunnels under the city seems to drag on a bit. but I really love the scenes in the cemetery and in the crypt under the cemetery. During the story, Ms. Shearin references Makenna’s first day on the job guarding a bachelor party of leprechauns. This sounds like a hilarous story that can now be found in an anthology called Night Shift. Makenna spends a fair amount of time introducing herself to us in the beginning of the book, where she references her hometown of Weird Sisters, North Carolina — a town that attracts the weird and wonderful. With as much time as was spent on it, I was expecting to either find a short story about Weird Sisters or to have it become important in The Grendel Affair; but neither is true, as far as I can tell. I’d love to see a story or two about Weird Sisters; it sounds like there are generations worth of stories there to tell. The other story I would like to see is how Ian lost his first partner. We know it had something to do with “the ghoul” character that Makenna encounters both at the beginning and the end of the book, and we know it had a big impact on Ian. But we know only what Ian has told Makenna about the incident and we don’t know much about this “ghoul” character at all. I think there is plenty of fodder there for more interesting stories. Narrator: ♥♥♥♥♥ Johanna Parker, who also narrates the Sookie Stackhouse novels by Charlaine Harris, is the voice of Makenna Fraser and company. Being a fan of Sookie in audio, this did a couple of things for me. First, it gave me an instant affinity for the story since I liked Sookie and Johanna as her voice. Second, it made me picture Makenna as Sookie for a while. I can separate them in my head now, but I don’t think associating the two characters was actually a bad thing. They are fairly similar; both gals are blonde, Southern, and fairly normal except for one small talent — the ability to sense something others can’t. Neither have any special abilities that make them physically or mentally superior, and they both have faults, make mistakes, and have adorable quirks. It was a smart choice to have Ms. Parker read the SPI novels as it will lead some listeners to associate Ms. Shearin’s world with Ms. Harris’, and who wouldn’t want to be associated with such a success? 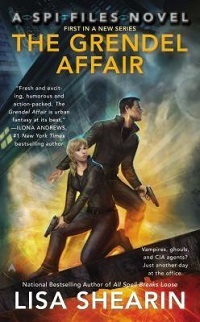 Overall: ♥♥♥♥♥ The Grendel Affair is a fun adventure with likable characters and just the right amount of humor. I think I enjoyed listening to it more than I did reading it, particularly because I already have a “relationship” with Johanna Parker. The story is more than fluff, but not a super serious or gritty adventure — it’s a “popcorn flick” of a book that makes for an entertaining few hours. One Book Two will be reviewing the sequel, The Dragon Conspiracy, in a couple of weeks, so stay tuned for that. If you haven’t read them yet, the Sookie Stackhouse novels by Charlaine Harris would be good for fans of Makenna in either book or audio form. You might also like the Paranormal Scene Investigation series by Laura Anne Gilman or the InCryptid series by Seanan McGuire. Of course, there is also the Raine Benares series by Lisa Shearin, but we haven’t read that one to recommend it.